We're pleased to present the full Q&A digest from the Letter from the Producer LIVE Part XIII! If you missed the live stream, or if you just want to watch it again (and again), follow the link below! Please note that subtitles will not be added to the LIVE letter itself. Don't forget to select the 720p option to watch the video in HD! Q: Are there any class or item level restrictions for glamours? A: As long as the base and projected item can be equipped by the same class or job, it will be possible to cast a glamour. For an easy example, a black mage cannot use glamours to make himself look like a warrior. Also, the projected item cannot be of a higher equipment level than the base item. In other words, you won't be able to make level 10 gear look like Allagan equipment. The reverse, however, is possible. The restrictions aren’t all that strict, so rest assured that you should be able to use glamours as you like. Q: Please show us how glamours are used. A: *The video shows a demonstration of the Glamours system. From the Character screen, select the base item whose appearance you wish to alter and open the subcommand menu. By selecting the new "Cast Glamour" command, a list of all the equipment you currently possess will be displayed, and the items that can be projected as glamours will be highlighted. Select the item you would like to project, and a "Cast Glamour" option will be displayed, with the required glamour prism displayed under "Catalyst". Glamour prisms are not very expensive, so it should be easy for crafters to start making them and selling them on the market.. Once you’ve procured the appropriate glamour prism, select "Cast" and your base item will take on its altered appearance. In the event that you would like to restore the original appearance of your gear, glamours can be removed. From the subcommand menu, select "Cast Glamour" and then select "Remove Glamour." With a glamour dispeller on hand, press the "Remove Glamour" button and your gear's appearance will revert back to normal. If you want to change the appearance of an item you’ve already glamoured, there’s no need to remove the glamour—you can just overwrite its appearance with a new glamour. Glamours can also be used for accessories and weapons as well, so you can dress up with your favorite pair of earrings or a nice choker without sacrificing performance. Q: Will it be possible to project the appearance gear that occupies both chest and head slots, such as cowl-type equipment? A: Cowls can be projected onto other gear that occupies the same two slots. It's also possible to the reverse, and project the appearance of regular chest gear onto a cowl. That said, there are a few additional restrictions in such cases. Q: Will it be possible to change the appearance of weapons and accessories? A: Yes, this will be possible. Also, any gear that's been glamoured will have a plus sign displayed on the upper-right corner of its icon, making it easy to identify when browsing your inventory. If you select a glamoured item, the details of both the base item and the projected item will be shown, so you can quickly see which item's appearance is being projected. *The video demonstrates the process of casting a glamour on a weapon. Q: Will it be possible to cast glamours using seasonal event reward equipment? A: As long as it meets the stated conditions, yes it will. Q: Will it be possible to register glamoured equipment to gear sets? Q: Are there items that can only be obtained through the retainer venture system? A: Yes, there are. You'll be able to level your retainers as well as equip them with gear, and to obtain items with a higher degree of accuracy, you'll need to outfit them properly. Give it a try and see what rare items your retainers can hunt down for you. Q: How does the retainer venture system work? A: *The video demonstrates the process of interacting with a retainer and starting a venture. Needless to say, before you can unlock retainer ventures, you’ll need be able to hire a retainer—meaning that you’ll need to make sufficient progress in the main scenario. Once you’ve hired a retainer, you'll be able to undertake the quest to unlock ventures. The first thing you'll want to do after unlocking retainer ventures is to assign your retainer a class. Select “Set retainer class” from the retainer menu, then choose either a Disciple of War/Magic or Disciple of the Land class. The items your retainer will procure will depend on the type of class you pick. In other words, you’ll want to choose based upon whether you’re looking for items dropped by enemies or those obtained by gathering. Once you’ve set your retainer’s class, you’ll need to set a main arm. From the retainer menu, select "View retainer gear and attributes." Here you can outfit your retainer with gear and accessories. After equipping a main arm, the “Assign venture” option will be added to the menu, displaying a list of available ventures for your retainer. Assigning a venture requires payment in a unique currency of the same name─ventures. Since the Adventurers' Guild pays the wages of retainers, adventurers are not permitted to pay them directly in gil, so think of it as giving your retainer a tip for their services. There’ll be a variety of ways to obtain ventures, which include purchasing them with grand company seals and receiving them as rewards for completing beast tribe daily quests. When your retainer’s level is still low, you’ll only be able to assign them ventures suitable to their level. The quantity of items that they procure will also be limited. As your retainer’s level increases, you’ll be able to instruct them to procure specific items. The duration of time required will vary by assignment, and these times will be displayed in Earth time for your reference. For example, you could assign a venture to a retainer right before you head out to tackle a dungeon or other duty, and when you return the assignment would be completed. You'll be able to check the time until completion from the Duty Timers window. Note that in order to reduce server burdens, this information is saved to your local client, so you might encounter slight discrepancies in the time display when switching between the PC and PS3 versions of the game. The correct time and information will be refreshing when you re-summon your retainer. Basically, you assign ventures to your retainer, and upon completion they will receive experience points and gradually level up. It’s also possible to change a retainer's class—any experience points they gained up to that point will be reset, but it shouldn’t take too long to level them up again. You're able to hire two retainers for free, which means you can arrange it so one is a Disciple of War or Magic and the other a Disciple of the Land. Q: Will we be able to store and retrieve items from retainers as well as sell items on the market while retainers are on ventures? A: Yes. We had a long discussion about this, because from a story perspective it would be quite strange to have your retainer return from a venture every time you ring the summoning bell. In the end, however, we felt it would be problematic if you were unable to store and retrieve items after assigning a long term venture, so we’ve made it so they will return to you temporarily. Q: Will it be possible to cancel an assigned venture midway through? A: Yes. However, please note that the payment in ventures you made upon assigning the venture will not be returned. Q: Will we be able to hire additional retainers? A: Thank you for your patience on this. As of patch 2.2, yes, you will be able to hire additional retainers as an optional paid service. Up until now, retainers have served simple the roles of item storage and selling items on the market. However, with the introduction of the retainer venture system giving retainers an expanded role, we'll be making it possible to add two additional retainers. Q: Is the $2 fee for an additional retainer slot a one-time fee? A: Due to increased server resource requirements, the fee will be $2 per thirty days. Q: Please tell us everything you can about gardening, from planting seeds to harvesting crops. A: Needless to say, first you’ll need a place to put your garden, which means that you'll need access to a free company estate. Garden patches will be sold as garden furnishings, so you can purchase them and place them on your estate grounds as you see fit. The number of seeds you can plant will depend on the size of the garden patch purchased. Once your seeds are planted, you’ll have to water them and add fertilizer on occasion. Even if you neglect your garden from time to time, your plants won't wither and die easily, but good care will result in a quicker harvest, so it might be wise to have your free company members work in shifts. Also, overfeeding your plants will not cause them to wither, so no need to worry. Continue tending to your plants, and after enough time passes (Earth time), you'll be able to harvest your crops. The items you can harvest will depend on the type of seeds you planted, and you’ll also be able to obtain seeds, allowing you to replant the same crops if you desire. It's also possible to intercross seeds planted next to each other. Certain high-tier and rare seeds can only be obtained through intercrossing various species of plants, so be sure to consider the layout of your garden carefully. The rarest items you can obtain through gardening will only be yielded by repeated intercrossing with a perfectly maintained garden. Certain items are obtainable only through gardening, so we encourage all of you to experiment with various intercrossing theories. Q: How much land will gardening take up? A: We've prepared three different garden patch sizes and have made it so they don't take up an excessive amount of space. While any type of seed can be planted on even the smallest patch, the number of seeds you can plant will depend on the size of your garden. Also, the number of garden patches you can place on your estate grounds will depend on the size of your free company estate. Q: How much time will it take until we can harvest crops? A: It will vary depending on the fertilizer used and the frequency with which you tend to your crops, but approximately three to five days on average. Q: Will we be able to set permissions for gardening? A: Yes, you will. More specifically you'll be able to restrictions on which members can plant seeds, and which can harvest or remove crops. All members will be permitted to tend to plants. Q: Please tell us the item level of the new gear coming in patch 2.2. A: The maximum item level for weapons implemented in patch 2.2 will be 115, with armor going up to item level 110. The progression of item levels will look something like the following: 90→100→110→115. Q: To coincide with the increase in item levels, will it be possible to further enhance job-specific weapons? A: In my 55th Letter from the Producer, I touched upon the Saga of the Zodiac Weapons, which will be introduced in patch 2.2. This isn't something you should expect to complete in patch 2.2—it will continue through patch 2.25 and 2.3. Until now there have been mainly two means of progression: the first being defeating powerful enemies in end-game content to obtain high-item-level equipment, and the second being collecting Allagan tomestones to purchase gear. The Zodiac Weapons do not have the restrictions of these two methods, but are designed to take a long time to complete. As they require the collection of items with a low drop rate, their item level has been set fairly high. Ultimately you'll be able to customize attributes such as spell speed and critical hit rate to a certain extent, and we plan for the design to change significantly over time. This will essentially become the weapon upgrade system that I've been talking about up until now. Q: Will the item level of equipment for Disciples of the Land and Hand classes also increase? A: We'll be adding new main tools and headgear in patch 2.2. These will be critical for crafting the new high item level equipment using the challenging recipes learned from master recipe books. While there are no limitations, it’s been designed to take a long time and I think that trying to master every class will be quite difficult, so it would be best to choose just one class to start with. Q: Is the item level for the equipment from the Second Coil of Bahamut and the equipment that you can purchase with Allagan tomestones of soldiery the same? A: Strictly speaking, the item level of equipment that can be purchased with Allagan tomestones of soldiery and equipment that drops directly from the Second Coil of Bahamut is different. In patch 2.0 and 2.1, the equipment from the Binding Coil of Bahamut and the equipment you could obtain with Allagan tomestones of mythology were exactly the same, and I think this detracted from players’ motivation. This time around we've prepared something a little different, so they won't necessarily be equal. As I mentioned earlier, we’ve prepared three main ways to increase your item level, and regardless of which route you take you’ll be able to achieve the same item level in the end. The system has seen some adjustments with this patch, so we encourage you to give it a try. Q: How far will we be able to go with item level 90 equipment? A: The development team has confirmed that it possible to clear Thornmarch Extreme and Leviathan Extreme with an average item level of 90. As a reward for clearing Leviathan Extreme you’ll be able to obtain weapons, but it doesn't end there. You'll be able to increase the strength of these weapons, but you'll have to figure out how. You can also obtain accessories with excellent stats from Thornmarch Extreme, but the battle will be a serious challenge. Q: Will there be equipment to fill the gap between item level 90 equipment and the highest item level equipment in patch 2.2? A: As I mentioned just before, it's been designed as follows: 90→100→110, and only the weapons will go beyond this to 115. Think of it as there being three stages. Q: Melding multiple materia to gear doesn't change its item level, but will this be possible in the future? A: We have no plans to allow players to raise the item level of gear using materia. We're currently discussing further additions to the materia system, and when the time is right, I'll be sure to tell you all about it. Just as I mentioned earlier when talking about the Zodiac Weapons, you won’t be able to increase the item level of gear, but we'd like to look into customizing other aspects of gear. Q: When will Fantasia be sold? A: We've received a lot of requests for this from fans even here at the FINAL FANTASY XIV: Full Active Time Event in Sapporo. Currently, we're preparing the servers to begin sales as soon as possible. I recently received the final specifications for the sale of Fantasia, and as long as I don’t find any issues, we’ll begin selling it. I'll be sure to make an announcement once everything is finalized. Q: Half a year has passed since launch. What sort of progress has been made with add-ons? A: We've just about finished the initial design, and are discussing the extent to which we'll release tools for creating add-ons. Since the UI team is currently devoting all their energy to the PlayStation®4 version's UI, we'll be picking up work on add-ons after the PlayStation®4 version is released. While half a year has passed, we are prioritizing updates to the in-game UI first, so please wait a bit longer. Q: When will personal housing be implemented? A: As I mentioned briefly in my 55th Letter from the Producer, we'll be making slight changes to housing specifications. When you join a duty or log out inside of an estate, you'll be placed outside at the estate entrance upon your return. When returning from a Duty you entered from within your house, you'll be placed outside of your home. Housing is quite resource intensive service-wise, so we're also working to make it function more efficiently. For example, when no one is inside of an estate, the animations for certain furnishings will be turned off. We’ve been keeping an eye on how many houses have no one in them while actually playing, and once performance levels have reached what we consider to be ideal, we'll release personal housing. Send me your questions for the next Letter from the Producer LIVE and I'll provide you with any follow-up information available at the time. Q: Could you tell us the specific effect of the Echo and which duties it will be applied to? A: The effect will differ depending on the duty undertaken. 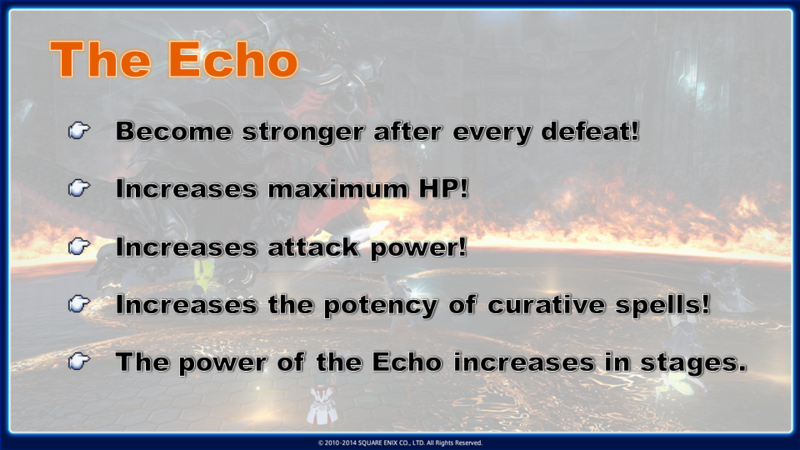 Players will receive the power of the Echo after being defeated in battle, raising their maximum HP, attack power, and healing potency incrementally. The first group of duties wherein players can receive the Echo includes The Bowl of Embers (Hard), The Howling Eye (Hard), The Navel (Hard), Thornmarch, A Relic Reborn: The Chimera, and A Relic Reborn: The Hydra. 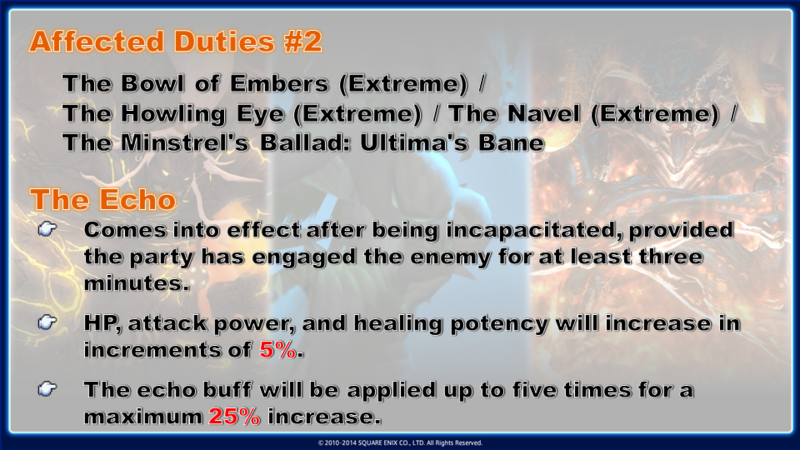 The Echo effect granted for these duties will be implemented with the release of patch 2.2. In order to receive the effect, you'll have to fight as hard as you can for at least 3 minutes before being defeated. The effect will grant you increased HP, attack power, and healing potency in 10% increments, and will stack up to a maximum of 50%. Players can also receive the Echo when undertaking the following duties: The Bowl of Embers (Extreme), The Howling Eye (Extreme), The Navel (Extreme), and The Minstrel's Ballad: Ultima's Bane. 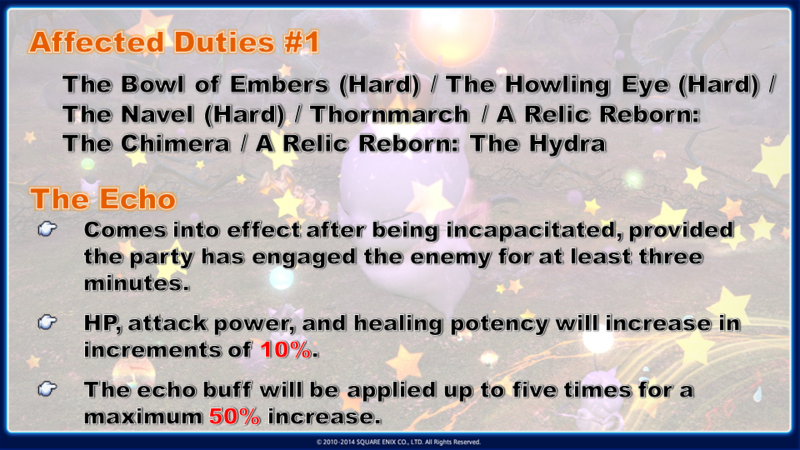 The Echo will be introduced to these duties in patch 2.2 as well. The requirements are also the same as the first group of duties; however, because these duties are intended to be more difficult, the effect will increase only in 5% increments, stacking up to a maximum of 25%. Still, I believe this will be a significant increase that will allow many of you to emerge victorious. 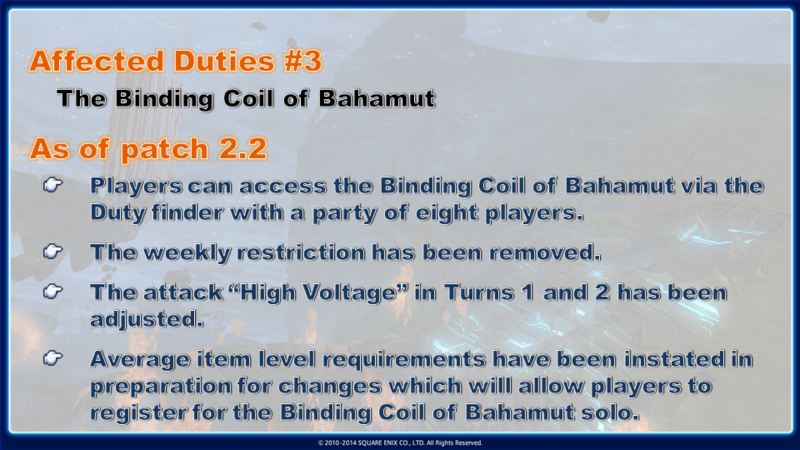 The Binding Coil of Bahamut needs the most thorough explanation, so I will discuss this in depth. After the release of patch 2.2, you will be able to queue for this content in the Duty Finder with a party of eight players. For example, after recruiting seven other players using the Party Finder, you’ll be able to select the Binding Coil from the Duty Finder. The entry restrictions have been abolished, so you can take on each turn as often as you like without having to clear previous turns. We’ll also be easing the effect of High Voltage in turns 1 and 2, allowing the paralysis effect to be removed with Esuna. Also, to coincide with the Binding Coil’s addition to the Duty Finder, we’ve imposed item level restrictions for each turn. 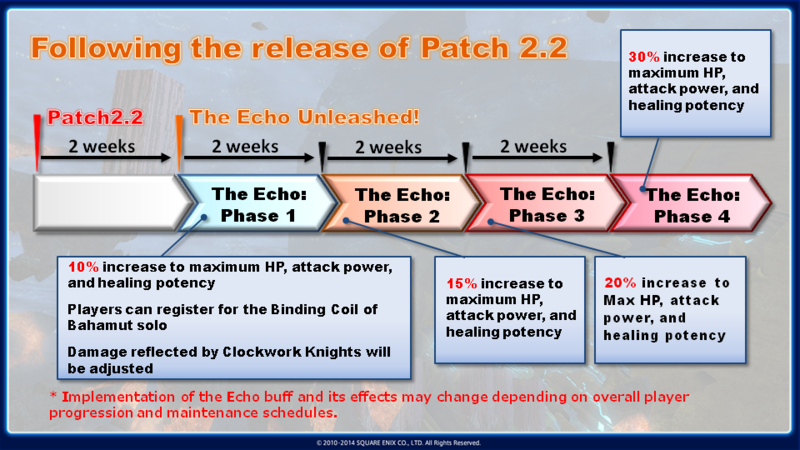 After patch 2.2 is released, we'll add the Echo buffs in patches that occur every two weeks. The first stage will be added 2 weeks after patch 2.2 is released. At that time, it will be possible to queue via the Duty Finder solo. Matching players together at random without the Echo could potentially make the encounter too difficult, and so the first phase will introduce the first level of the Echo, offering a 10% increase to HP, attack power, and healing potency. The effect will be applied upon entering the Binding Coil of Bahamut. Furthermore, the effect will increase every two weeks, first to 15%, then 20%, and finally a maximum increase of 30%. Although 30% will be the maximum, the Echo may be increased further depending on overall player progression through the Binding Coil. The first phase we will also see adjustments to the magic damage reflected by Clockwork Knights in turn 4. In short, we'll be making adjustments so that the Binding Coil can be cleared regardless of what jobs get matched together in the Duty Finder. *The video shows the schedule for how the Echo will be implemented. Q: Will there be any PvP adjustments in patch 2.2? A: We'll be implementing a system that makes it less likely for players with lower PvP ranks to get matched with people with higher PvP ranks. Also, because you can obtain all PvP-specific gear after reaching rank 30 and become extremely powerful very quickly, we'll be making adjustments to the timing of rewards to make the upgrade process more gradual. We are also planning for a large update to the Wolves' Den in patch 2.25, at which time we'll raise the maximum PvP rank to 40 and implement the new PvP-specific equipment that I've shown off previously. We're calling this the “Animal Series,” so if you are into PvP, be sure to get this equipment and try it out with glamours. Significant progress has also been made on Frontlines PvP. This will be field combat that takes place between three opposing groups. We’re working toward for a patch 2.3 release, and it will be an extremely large update. We’re currently finalizing the rules and the other specifics, and during the next LIVE letter, I’d like to show off Frontlines and explain a bit more . *The stream shows off screenshots of the PvP-equipment to be added in patch 2.25 and the Frontlines content. Q: Will you be adding new grand company ranks? A: We plan to add these in patch 2.3 at the earliest, and we're finalizing the details now. In addition to new ranks, we’ll be adding new rewards, so we're discussing what kinds of rewards should be available. Q: When will we be able to take on the Crystal Tower with a pre-made 24 person alliance? A: This will be possible as of patch 2.3. With the next update to the Crystal Tower, players will be able to form a 24-person alliance and undertake this challenge. Q: Do you have any plans to release a roadmap? A: We were able to launch the game according to schedule, and managed to release patch 2.1 in a short period of time. With that said, we’ve been receiving a lot of requests asking for smaller more frequent updates to give players more things to do, or challenges similar to Treasure Hunts that whole free companies can take part in, so we are currently discussing adopting a development method that allows us to implement smaller updates alongside our core objectives. We’ve made adjustments to our roadmap, so releasing it would constrain us from adapting as we go along. Rather than a definitive roadmap, we would like to provide an update list similar to the one used during 1.0, which would show the status of updates, and are planning to do so after the PlayStation 4 version has launched. With this method, we plan to update the list around the time each Letter from the Producer is released, and I think this will make it easier to get a sense for how various updates are progressing. Q: What’s the status of the Gold Saucer and when will it be implemented? A: Planning for the Gold Saucer is well underway, and we plan to introduce it with three core elements of play: games designed for a large number of players that involve growth, tabletop games for several people to play together, and single player mini games. We'll make an announcement when more details are available, so stay tuned. Q: Will it be possible to summon our companions while waiting for the Duty Finder? A: The current design of the Duty Finder makes this change somewhat complicated, but we're working to try and find a way to make adjustments in patch 2.3. We'll get back to you with more information as it becomes available. Q: Will there be any class or job adjustments in patch 2.2? A: There will not be any large changes to classes or jobs, and there are no real battle- or job-related items listed in the patch notes. It's safe to say there have been no adjustments made. Q: Are you planning to release special job rewards like the unicorn? A: Before talking about these rewards, I would like to talk about the lack of tanks. There are two types of tank insufficiency issues: a lack of tanks for the low-level Duty Roulette from level 15 to level 50 and a lack of tanks for end-game and the high-level Duty Roulette. In order to have more tanks join the low-level Duty Roulette, we’ll be boosting the role bonus so the gil you are awarded with is six-times higher than what it is now. The stress on tanks for these lower level duties is not that high, so we hope players will proactively participate and practice tanking here. On the other hand for end-game encounters, there is a lot of stress and responsibility on tanks, as well as a lot of things you have to remember. We also realize there are many players who take great pride in playing as a tank and try their best to play this role. As a way of saying thank you to these players, we've prepared special mounts as job-specific rewards. These mounts are a reward to keep tanks who constantly challenge end-game encounters motivated. Warriors will receive the “Warbear,” and paladins will receive the “Warlion.” Both of these mounts will be sized to match your race. The Warlion was designed to fit really well with the image of a paladin if you're using Glamour to project your job-specific equipment. Both jobs have their own achievement which grant a mount upon completion. *During the stream Yoshida mentions the role bonus will be seven times greater, but adjustments were made and it was changed to six times the current bonus. *The video shows off gameplay of the Warbear and Warlion. Q: Will it be possible to queue for the Duty Roulette as a party? A: We're currently working on this for patch 2.3. Q: Will you be increasing the number of indoor and outdoor furnishings that can be placed on estate grounds? A: This relates to what I said earlier about personal housing, but if we were to increase the cap on the number of furnishings you can place on estate grounds, it would put more stress on the servers, and as a result, it would be difficult to confirm if the performance of housing areas is sufficient for unlocking personal housing. After patch 2.2 is implemented, we'd like to monitor how much time is spent inside and outside of estates, then calculate to what extent the limits on furnishings can be increased based on our findings. Although it's not difficult to actually increase the limit, we'd like to do this after properly confirming everything. Q: Please show us a demo of the new mounts and minions that will be added with the new beast tribe quests. A: Maehiro: The mounts that can be obtained from the beast tribe quests have been designed based on modes of transport that would be used by these tribes in day to day living. *The video shows off game play of the kobold mount that can be obtained from beast tribe quests. Q: Are there any plans to have new reputation ranks and continued quest lines? A: Maehiro: In patch 2.2 the kobold and Sahagin quest lines will be added, and in patch 2.3, the Ixali quests will be implemented. Once there are quests available for all of Eorzea's beast tribes, we plan to look over feedback from players, then look into adding new quests and reputation ranks. However, when we implement the Ixali quest line in the next patch, we'll also be increasing all of the reputation rank caps as a tiny bonus. Q: Will the music for the Gilgamesh battle be "Battle on the Big Bridge"? A: Maehiro: At the end of the trailer for patch 2.2 you just might hear a bit of "Battle on the Big Bridge", which should answer your question. Soken did a great job arranging it, so please look forward to the full song. Q: Please add the Hildibrand pose emote as a reward for the quests. A: Maehiro: In the Eorzea Collection video that was posted on the Developers' Blog, and that played during the break, we showed off some new dance emotes. One of these is actually an emote related to Hildibrand, and it will be implemented in patch 2.2. The Hildibrand series will continue as we move forward, and since Hildibrand’s pose is part of his identity, we would like to release this as a reward after a certain amount of time has passed in the series. Q: Are there any plans to add a voice for Hildibrand? A: Maehiro: Recording voices has to been done way in advance, and for FFXIV we need to record for five languages including Japanese, so we have to record a couple months prior to a patch’s release. While the quality of a cutscene may be enhanced with nice voice overs, the animation and story adjustments become more difficult to work with. We’ve been creating the Hildibrand cutscenes to be funny, and the cutscenes are adjusted by the scenario and cutscene lead constantly right up to the cutoff point. For Hildibrand, we’re prioritizing the quality and entertainment of the cutscenes themselves, so we won't be recording voices for them. Yoshida: I have to make the final checks, and I’m always wondering how long they're going to keep making adjustments until it’s done. If we record beforehand, it wouldn’t make it in time unless we record extremely far in advance, so just as Maehiro said, we wouldn’t be able to make the adjustments to the scenario for release. As we'd like to prioritize everyone’s overall enjoyment of the story, we’ve decided to do it this way. Q: Can you implement Hildibrand's clothes as equipment? A: Maehiro: For this as well, once the series has reached a certain point we would like to implement this along with the emote. I'll be sure to let the lead know! Q: These quests are so hilarious that I'd really like them to continue on forever, but do you have a conclusion in mind? A: Maehiro: The reception has been really great, and we are having a lot of fun developing them. The story will continue in patch 2.2 as well as patch 2.3, and we'd like to continue making updates through the 2.x series of patches. Q: I’d love to see a Hildibrand minion. A: Maehiro: I'll let the person in charge know. Q: How hard is the Gilgamesh battle? A: Maehiro: These side story quests were made to be something that everyone can have fun doing. The battle won't be difficult, but I think players will have a great time nonetheless. There are also a lot of fun surprises you won't find anywhere else. Q: Will Gilgamesh make an appearance elsewhere besides this quest? A: Maehiro: He might, but I can't say for sure just yet. Yoshida: You’ll just have to look forward to the conclusion of this quest line. Q: Which authors or creators influenced you the most when creating the scenarios? A: Maehiro: I love to read, and I read works from a lot of different authors, but I’d say the number one influence on my work is game designer Yasumi Matsuno. For more than half of my career I've worked with Matsuno. Originally, I was actually in charge of battle systems, he was a huge influence for writing dialogue and game scenarios. Yoshida: Right, but in between that you were also writing a lot of item text and flavor text. A lot of the detail text you see in FINAL FANTASY Tactics and such was written by Maehiro. Q: Will new voice acting be added for the quests and scenarios to come in the future? A: Maehiro: A bit was played during the patch 2.2 trailer, but yes, there will be voice acting, including a new character. Q: Will you be adding content that lets you experience the story of FFXIV 1.0 or stories that expand on what happened during the five years after the Seventh Umbral Era? A: Maehiro: We've received many requests for this, so I'd like to release them bit by bit. However, if we make them into quests where portions are just relived, the information may get a bit scattered. This is something that would serve to deepen everyone’s knowledge of Eorzea, so I’d like to be able to tell the story gradually through the main scenario. Q: After the start of the main scenario Miounne, Momodi, and Baderon of the Adventurers’ Guild don’t really show up again. Will they appear in new scenarios? A: Maehiro: While there really isn’t a large scenario that they will take part in, there will be times where they show up. They'll also have minor appearances in the main scenario for patch 2.2. Yoshida: They are there as supporting roles, and I believe they will frequently appear in the future. Q: Please implement a building such as a library where we can learn more details about the lore. A: Maehiro: This is also something for which we've received numerous requests. The Lore Team has some plans drawn up for something similar, but as we're prioritizing patch releases, they're a bit behind on this. There's a ton of lore that is yet untold in Eorzea, and I think we need to go deeper into each aspect gradually, so I’d like to look into this. More than a library, I would like to make it so you can obtain literature from different situations or record parts from dialogue with NPCs, so I’m thinking a lore version of the quest journal would be more appropriate. Yoshida: A plan for a weapons and armor compendium has come my way. The plan is to allow you to read about the origins of each weapon and armor after you have completed the series, and we would like to implement this as well. Q: Please tell us the theme for the expansion. A: Maehiro: Well, naturally we're working on this now, and while I can’t go too deep into detail at this point in time, I can tell you that one of the themes revolves around a great conflict that spans across millennia. Beyond this, I can only ask you to stay tuned for additional details in the future. Yoshida: I spoke a bit before about the expansion, and I said we were deciding on whether we should swim or fly. Well, we decided to go with flying so players can expect to look to the skies in the coming expansion. Q: As the main scenario writer have there been any cutscenes that you felt were really good? A: Maehiro: In patch 2.2 there is a scene where a certain character gets really uncomfortable trying to clean up their "tarnished" image, and I personally really enjoyed that scene. There is also a scene in 2.0 where Yda duels with a member of the Garleans. It’s stereotypical, but I enjoy that kind of development. Q: Will we ever visit the city of Sharlayan? Q: Will Edda make an appearance again? A: Maehiro: Edda will return for the new scenario in patch 2.3. Yoshida: Look forward to how she will make her return. Q: Will there be other characters from 1.0 that make an appearance in ARR like how F'lhaminn did in patch 2.1? A: Maehiro: We don’t really have any specific characters in mind that we want to reintroduce, but if there is a time when we need to bring them into the story, we will introduce them at the right time, just like F'lhaminn. Q: A lot of names from Ivalice have been mentioned such as Dalmasca, Belias, and Zodiak. Is there some kind of connection between Hydaelyn and Ivalice? A: Maehiro: To be absolutely clear, there is no direct connection between FFXIV’s Hydaelyn and FFXII’s Ivalice or even FFXI’s Vana’diel. They are not the same world in different dimensions or time—they are their own separate worlds. However, there are certain connections to people or objects that appear in these other worlds that figure into the story of FFXIV as it has been conceived and is being told. Yoshida: We’ll be revealing more as we move forward. Q: Will the day come when we fight Nidhogg mentioned in the dragoon quest line? A: Maehiro: Nidnogg is a dragon that lives in Ishgard, so I believe if you are able to go there you might be able to fight him. Q: When will we be able to go to Ishgard? A: Maehiro: Being able to actually go there is a bit off in the future, but in patch 2.2 the wheels of the story will start turning and in patch 2.3 there will be some direct connections. Yoshida: You cross paths with heretics in the main scenario, but there will be more to it soon. Q: Will you be adding quests that let you relive the founding of the three city-states, the foundation of the grand companies 1,500 years ago, or when the map of Eorzea was completed 70 years ago through the use of the Echo? A: Maehiro: Honestly speaking, we don't have any plans for this at the moment. We're still focusing on modern day Eorzea, as there are a lot of aspects that have not been covered yet, and we’d like to prioritize this first. Afterwards, we can gradually look into it as we keep an eye on what’s going on. Q: Please tell us why you decided to eliminate Allagan tomestones of philosophy. A: In patch 2.2 we will be adding Allagan tomestones of soldiery, and Allagan tomestones of mythology will come to serve the role that philosophy tomestones did previously. The current cap on mythology tomestoneswill also be eliminated. With this, there was really no role for philosophy tomestones, and you would just be getting a ton of them from all sorts of duties, so we decided to eliminate them altogether. You’ll be able to exchange the philosophy tomestones you have on hand for mythology ones via the NPC Auriana in Revenant’s Toll, so please rest assured that they will not go to waste. The items you can purchase with philosophy tomestones, such as Darklight equipment and crafting materials, will become drops from various dungeons. For example, if a new player is starting with the game from PS4 launch, they will start from a time without any philosophy, and after reaching level 50 through clearing the main scenario, they can obtain gear by going through dungeons like Wanderers’ Palace and Amdapor Keep to become stronger. By doing this they will be able to obtain Darklight equipment. Also, if you're working on a secondary job and want Darklight, you’ll be able to obtain it by going through dungeons where you can also earn Allagan tomestones of soldiery. Also, the crafting materials that could be purchased with philosophy tomestones will now be obtainable by purchasing them with grand company seals, as rewards from treasure hunts, from dungeons, and through other means. New players that begin the game in the future will have an easier time procuring item level 70 gear through the market rather than finding Darklight. After this, they can go through the Crystal Tower, and then save up mythology and purchase equipment. With this, the economic conditions will change quite a bit, so please keep an eye on the market boards.